1. The core of a massive star in a distant galaxy collapses, and deep inside, twin beams of matter and energy begin to blast their way outward. 2. 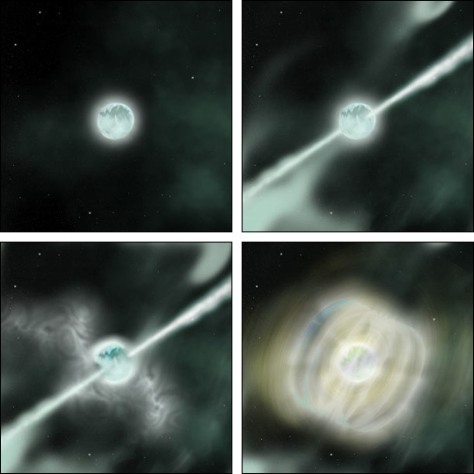 Within seconds, the beams have eaten their way out of the collapsed star, seen from Earth as a gamma-ray burst 3. Within seconds, the beams have eaten their way out of the collapsed star, seen from Earth as a gamma-ray burst 4. The stellar core has shrunk into a magnetar, whose magnetism is what powers the long-lived afterglow of X-rays.